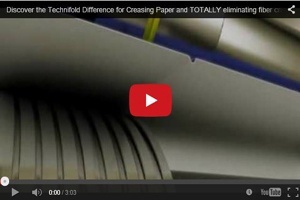 The Tri-Creaser™ Fast-Fit increases productivity over other Creasing Solutions! Our Tri-Creaser™ Fast-Fit offers the world's very best in rotary creasing technology that eliminates common fiber cracking problems on both folding or scoring machines. The new patented split creasing rib increases productivity by dramatically decreasing set-up times over other Tri-Creaser™ solutions. With 8 creaser settings, the Tri-Creaser™ Fast-Fit can provide a perfect creasing solution for light, medium and heavy paper stocks.